Parties will study the feasibility of a 100-megawatt renewable energy-powered water electrolysis facility in the Amsterdam region. The project will reduce emissions by substituting thermal generation with renewable electricity as the power source for electrolysis. Chemical giant Nouryon has partnered with Tata Steel and the Port of Amsterdam to study building what could be Europe’s largest green hydrogen cluster. The 100-megawatt renewable energy-powered water electrolysis facility would be located in the Amsterdam region of the Netherlands and would be capable of producing 15,000 tons of hydrogen a year, as well oxygen for industrial use at Tata Steel’s IJmuiden Works. 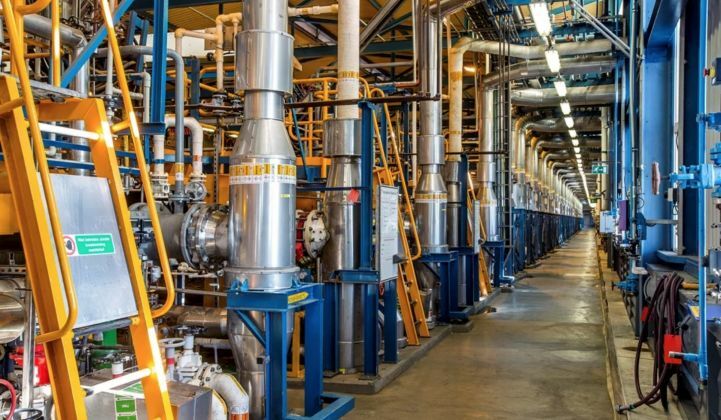 IJmuiden, which produces organic and metallic coated strip products for global markets, would act as the primary customer for the hydrogen and oxygen from the electrolysis plant. The hydrogen would be used for industrial processes rather than power generation. Nevertheless, it would cut emissions by substituting thermal generation with renewable electricity as the power source for electrolysis. “By using renewable electricity, the initial unit will enable carbon savings of up to 350,000 tons of CO2 per year, equivalent to the emissions of more than 40,000 households,” said Nouryon, formerly known as AkzoNobel Specialty Chemicals, in a press release. Renewable hydrogen could also be combined with carbon dioxide, waste or steel mill gas to make plastics and thus reduce emissions through “new, circular value chains,” the release said. Hans Fischer, CEO of Tata Steel Europe, said in a statement that the facility could play a role in helping the company become a carbon-neutral steel producer. The Port of Amsterdam, meanwhile, would build distribution infrastructure so the hydrogen could potentially be used in other applications, such as transportation. “The partner companies have the ambition to further scale up the technology,” according to the press release. It’s an ambition that could take a while to materialize, though. A final investment decision on the project is not expected until 2021, said Nouryon. And if the project goes ahead, building the hydrogen cluster would take up to a couple of years, according to Marcel Galjee, energy director of Nouryon. That likely means at least 2023 before production starts. Nouryon is positioning itself to be a major supplier of the stuff. The company is already owns a gigawatt-scale electrolysis portfolio, with a total hydrogen production capacity of around 100 kilotons a year. Nouryon’s existing plants include 380 megawatts of chlor-alkali processing capacity in the Netherlands and Germany, 620 megawatts of sodium chlorate process capacity and 10 megawatts of water electrolysis in Norway. The chemical giant is also looking to help create markets for green hydrogen by participating in a number of pilots across Europe. These include the deployment of fuel cell buses in Rhine-Main Region, Germany, an H2 refueling station in the Netherlands and a scheme to launch guarantees of origin for green hydrogen across Europe. Nouryon already has experience working on the kind of project envisaged at Amsterdam, through a German initiative called Carbon2Chem. Led by the industrial engineering giant Thyssenkrupp with the Fraunhofer Society, as well as the Max Planck Society and 15 other organizations including Nouryon, Carbon2Chem uses renewably produced hydrogen to synthesize chemicals from steel mill waste gases. The Carbon2Chem project started producing sustainable methanol from metallurgical gases at Thyssenkrupp’s Duisburg plant this year. The project includes a 2-megawatt water electrolysis plant and was funded with €60 million ($69 million) from the Federal Ministry of Education and Research and €34 million ($39 million) of Thyssenkrupp’s own cash. In addition to the Amsterdam hydrogen cluster, Nouryon is investigating large-scale conversion of sustainable electricity into green hydrogen via water electrolysis in partnership with the Dutch gas network operator Gasunie. The companies are eyeing the installation of a 20-megawatt water electrolysis unit in Delfzijl, the Netherlands, to convert sustainably produced electricity into 3 kilotons of green hydrogen a year, enough to fuel 300 hydrogen buses. A final decision on that project is expected in 2019, Nouryon said. Galjee said the trend toward building green hydrogen infrastructure was likely to increase across Europe. “We’ve seen the cost of renewable electricity steeply declining, and that’s one of the key enablers,” he said.